I’ve been running around trying to get a bank of recipes together for my cookbook project. I made these today, and they would have been so good had they not melted my mouth. Apparently jalapenos range from 2,500 to 10,000 scovilles, and I guess the peppers I picked up were closer to the latter. I took one bite and had to fly into the kitchen to rip a chunk of bread off the nice loaf that Stewart bought earlier today. I ended up eating the breading off, and scooping the filling out with my fingers. Not very good table manners, but I wanted to eat them! Next time I make these I should test the heat of the peppers before I begin filling them. 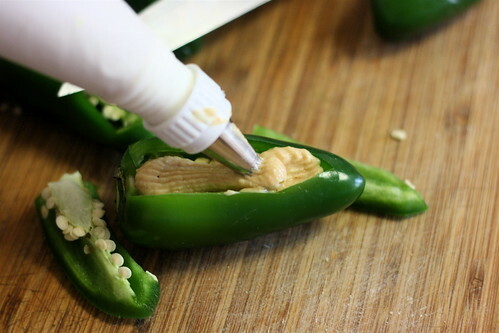 Use the tip of a sharp paring knife to cut a little door out of the side of the pepper. Some recipes say to cut the entire pepper in half, but those recipes have sticky cheese in the middle to help the pepper glue itself back together. Again, with the tip of your knife, try to remove as much of the seeds and membranes as possible. They sort of hang down in the pepper in a cone, so if you cut the top and slide your knife down the sides, it should come out without too much fussing. Remove any membranes from the little door, too, since you’ll be using that piece. Oh, and leave the stems on! If you have a pastry bag, use that to fill the peppers. If not, a ziplock with the corner cut off will work just as well. You want to put enough filling in so that the door sticks to the pepper when you put it back in place. If a little of the filling squishes out, just wipe it off and eat it, as long as no one is watching. They should hold up well enough while you’re covering them in batter, and once they’re fried they’ll be sealed shut. I need to go find some peppers that don’t want to kill me so I can make this again. I learned that the hard way too! 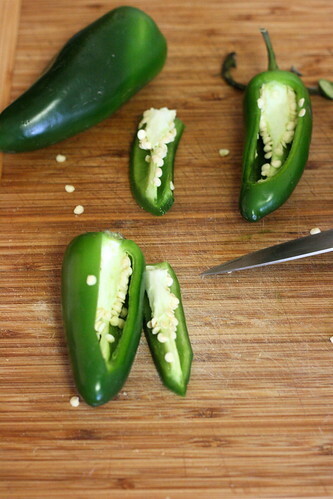 The people who make poppers for restaurants must use a special weak type of jalapenos! Funny, I had the same problem with the jalapenos I bought here a few months ago. I used them for tomatillo sauce, but it was inedible due to the extreme heat. Odd, in the past the green ones like that have been so mild that I wasn’t sure there was even jalapeno in the food. Those look tasty, and I’m looking forward to the zine. This has happened to me, too. I hope your mouth fells better now! I am really looking forward to see your zine. And I hope it will grow into a book. Wishing you luck and success! That looks so pretty and easy! I need to make some of these next time I have a party! OMG. Poppers and like my favorite EVER. I’ve heard that generally the bigger jalapenos are less spicy and getting all the seeds and white stuff surrounding the seads is imperative. Maybe blancing them first would make them less spicy? Once you divulge your recipe I’m all about doing this to banana or pablano peppers and making a meal out of it! Those looks SO GOOD. Seriously, in my pre-veg days poppers were definately a favourite. You’re amazing for coming up with a vegan version! You definately have one future subscriber/book buyer here. Those look amazing. I love jalapeno. I’ve been looking for help on how to make thiese! Would you share how you get the breading to stick? these look fantastic. gorgeous photograph as always. I will buy that cookbook! Those look amazing! I love jalapeno poppers. By the way, I baked the lavender shortbread cookies this weekend and I was so impressed. The recipe is so simple but yummy. Hi! I publish a vegan magazine here in Canada and I’d like to send you a copy! Do you have a PO box of an address to which I can send it? Please email me and let me know. I love your photos so much! You’re very inspiring! 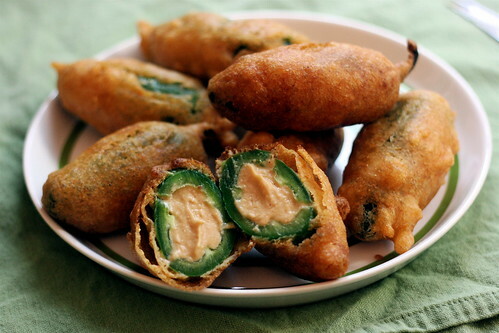 I’ve never had jalapeno poppers because i’m afraid of the exact situation you described. ok. holy cow. you will please move next door to my wife and i, that we can always ‘accidentally’ drop in a dinner time. Hi, most of the heat in the jalapeÃ±os and other pepers is in the stems and specially in the seeds, if you remove them, this should bring it down a bit. If you want to bring it up, you can “torear” the peppers, heat up a skillet with no oil and slightly roll them around so the skin heats up and maybe toasts a little. As for bringing it down, try removing the insides. I found out from a neighbor years ago that if you look at the jalapeno when you are buying it…the more lines _ _ _ _ – - – - – and the larger and longer they are the hotter the pepper will be. If there are no lines the pepper hasn’t got has much heat. My husband loves these, I have to fill mine into red bell peppers which are delicious, next time I plan to roast it on the grill, I prefer the that taste on the red bell pepper. You have some great ideas on the peppers but I would like to know what you use for a coating and how you make it look sooo beautiul on you peppers? I keep losing all my coating with the recipes I have tried…HELP!!!! Thanks!!!! If you want to diminish the hotness level of the poppers, try cleaning them out, if you remove the seeds and the inside veins, they will be more bearable…trust me I live in Mexico. Antonio – I did say in the post to remove the seeds and membranes. :) It definitely helps, but thee were still too hot to eat! the problem is you are using fresh jalepenos. i think most of the poppers (or armadillo eggs, as we call them in texas) are made with pickled jalepenos, which are much weaker in heat. If you can’t stand the heat, stay out of the jalapenos! Pickling chilli’s leeches out a lot of the heat and often even makes them a little bit sweet. Very suited for this recipe! You could try blanching or lightly boiling the jalepeno’s before you stuff, batter and fry them, this makes them a little softer after frying and can take out some heat. Also if heat really is a continuing issue and you haven’t tried a cheese-stuffing, try that, as cheese and dairy products help your mouth and throat cope a lot more with the heat. Sugar or something sweet, maybe strong cordial, is very good for if you accidentally get a bite that’s too firey and need to put the flames out! There’s enormous variation in heat for any pepper variety. I’ve had Habaneros that weren’t that bad, and Jalapenos that were killers. There’s only one reliable solution, and that’s to taste a bit of the pepper before you use it. Peppers from the same batch will probably have similar heat levels. Removing the seeds and membranes will help, but you need to check the heat before you use them so you know what you’re getting, and how much to use (for recipes where the chili is an ingredient rather than the focus). I love your new cookbook but about cried when this recipe wasn’t in there because this post made it sound like it was going to be! I neeeeeeeed to make these….are you planning on publishing the recipe eventually? Thank you, very well. buy online nolvadex http://www.stumbleupon.com/stumbler/med-brother/ buy nolvadex drug Happy New Year! I love poppers. I’ll repeat what others have said: you have to get ALL the seeds out. In fact, you can make a milder crushed dried red pepper if you shake the seeds out (older folks, use an album cover and pretend you’re back in the ’70s cleaning your, ummm…). But the real trick to poppers is roasting the peppers in the oven until the skin toasts and splits and then you rub the skin off with a paper towel, piece of newspaper, brown paper bag, whatever. I was led here looking for cheese substitutes for those with impaired kidney function. There are an awful lot of people who have that and they have to limit minerals–sodium, potassium and phosphorus. Yeast, nuts, dried beans? High in phosphorus. They can always take a phosphorus binder but that’s another pill. Well, it’s just a spare time thing when I think of it. Vegan is a choice; kidney failure isn’t. A vegan with kidney failure? Wow…that would be rough. I was just checking out the contents of your book, which I ordered. I remember testing the “bean cheeze” and making these poppers when you were still in the testing stages. The recipe didn’t make it into the book, so I was hoping you’d post the recipe for the original “bean cheeze.” it was so good, I could have eaten it all with a spoon before they even made it into the peppers!!!! I know this original post was a long time ago, so I”m hoping you see it and respond! Thanks! The amount of heat in a pepper (membranes aside) depends greatly on two factors. The first is obvious, the type of pepper. The second factor has to do with the climate the pepper is grown in. The hotter the climate the hotter the peppers with be. For example I lived in Arizona and was advised to buy milder seeds than someone who lived in say Colorado. This was because if I bought the same seeds as someone in Oregon the ones I planted would turn out spicier because of Arizona’s hot climate. Weird, huh? I got that advice from cherrygal.com Not sure it helps though, unless you live somewhere colder and buy ones that were locally grown. Oh I forgot to add, fatty foods such as sour supreme and avocados, will hasten the omg spiciness out of your mouth, I’ve also been experimenting rubbing my fingers on stainless steel, like with garlic. I think it helps but it is difficult to say since I’m not brave enough to test my fingers out on my mouth or eyes after wards. Who is cooking with Lavender? You may want to research what Lavender oils can do for boys (maybe men). Google: Lavender and Tea Tree Oils May Cause Breast Growth in Boys … So throw out that shampoo if you have men in the house. Not sure about cooking and eating it though… But I wouldn’t personally.